2 by 3 Heroes: I got skillz! 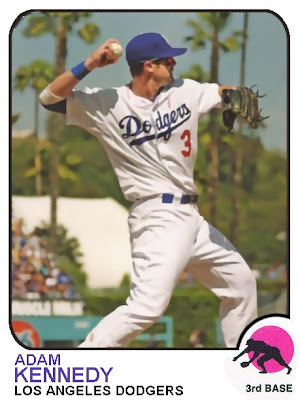 We all, by now, should have seen Adam Kennedy's Topps Update card. It's a beaut of a picture. Bit of a shame that it's on the 2012 template. Seems more like a 1973 photo if you ask me. So here ya go. Besides that pink by his neck, which the filter seems to have made pretty invisible, I think it's dandy. It's no Luis Alvarado, but what card really is?